Unless you want to spend every morning scraping the ice off your car’s windshield throughout the winter, you should consider investing in a windshield cover instead. These covers are relatively affordable, easy to use, and even easier to store. 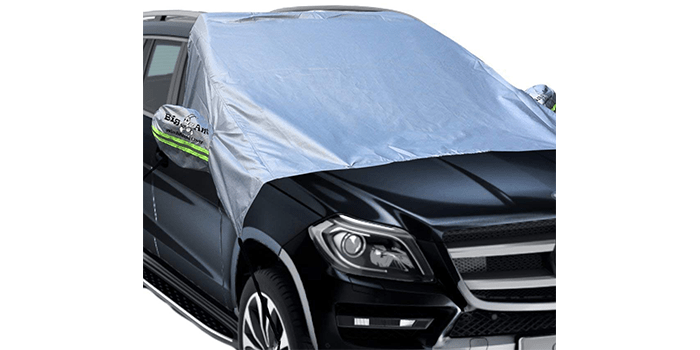 Depending on your budget and car specifications, you can get covers that not only protect your car against the freezing cold but covers that also serve alternative tasks as well. As far as usage goes, you can easily set a cover in place in less than a minute or so, whereas the removal process takes even less. When compared to the half of hour you would otherwise spend trying to scrape ice off the windshield, it is quite the improvement. With that in mind, let us point out that not all snow covers are built to the same standards, especially the cheaper models. Instead, let’s take a look at the ten best snow covers the market has to offer and find out what makes a good windshield snow cover to begin with. 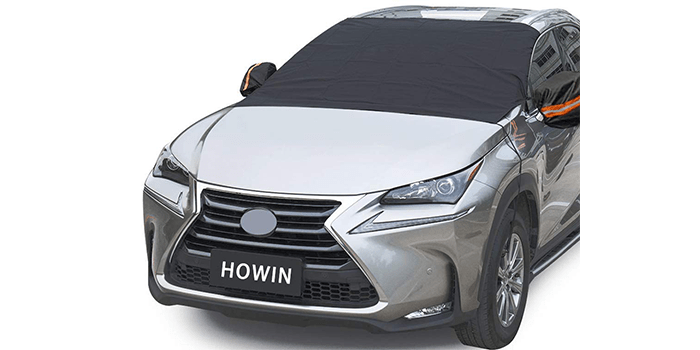 With the Howin Windshield Cover, you can forget about heavy winds, snow, and ice come winter time. The edges have strong magnets and the hooks are made from elastic that can be fitted into the wheels for a secure hold. The door flaps are double stitched that keep snow, ice, and winds out successfully. Added to the cover, there are two rear view mirror covers that have orange reflective strips to keep collisions at bay. The cover can be installed quickly and within a few minutes. With the black front, snow and ice is kept away from the windshield while the silverback blocks out harmful UV rays in summer. The iceScreen Pickup Truck Cover Windshield Protector can be extended to cover the gutter as well as the windshield wipers to protect your car completely. The cover has reinforced extra strong magnets that keep the cover in place at all times. With the help of storm straps, the protector is kept in place even in high winds and blizzards. On the reverse side, the cover has a heat shield to keep snow off the windshield. 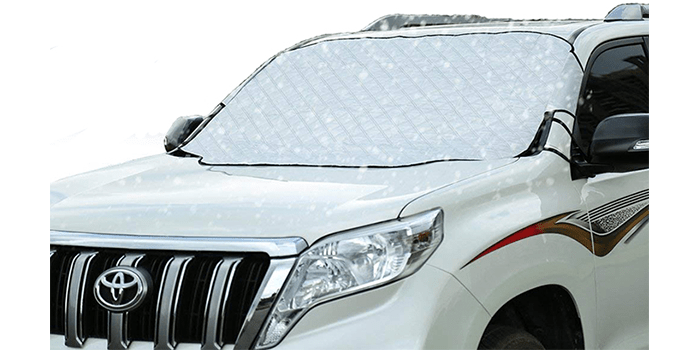 The MATCC Car Windshield Snow Cover is made from high-level PVC fabric and is completely waterproof, sun-proof, dust-proof, frost-proof, and fire-retardant. The thick layer of protection keeps UV rays out of the car during summer. No more will you have to worry about scraping snow and ice off the windshield when you use this incredible cover. It is easy to install and the door flaps simply tuck into the doors for a secure hold even in heavy winds. The Big Ant Windshield Snow Cover has both magnets and elastic ends to secure the cover over the windshield and keep snow and ice away. With adjustable straps, this cover can extend over any size car. It offers great protection from heavy winds, snow, and ice. The four corners have straps with hooks on the end that attach to the wheels. The cover can be tucked into the car doors to ensure a secure hold. The protector also has reflective warning bars for the mirrors to keep any unwanted impacts away. Considered as one of the best universal windshield snow covers out there, the Marksign Windshield Snow Cover fits the windshield, side mirrors, as well as part of the hood. There are four elastic straps that end in hooks that attach to the wheels for a secure fit. The cover fits most cars including SUV’s. Measuring a total of 60 x 90 inches, the cover spans over a lot of the front of the vehicle and keeps ice and snow off. Made from PEVA fabric and laminated with aluminum, the cover keeps the cold out in winter and the harmful UV rays out in summer. Not just that but the cover also features orange reflective strips on the side mirror covers to avoid collisions at night. Thanks to the Great Barrier Car Windshield Snow Cover, never again will you have to scrape snow off your windshield when you use the Great Barrier Snowblitzer Car Windshield Snow Cover. Just remove the cover and drive safely. 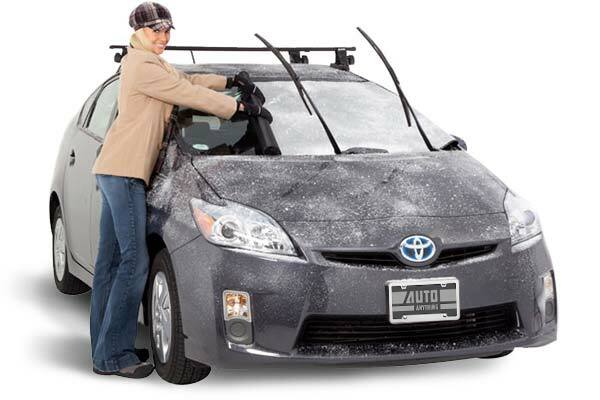 Thanks to the extra large ice screen, your windshield gets full coverage even on the coldest days with heavy winds. It even protects a part of the hood, wiper reservoir, and cowl. It can fit any size car including SUV’s. Furthermore, there are no less than 6 magnets at the end of the cover’s straps to secure the cover in place for a snug fit. 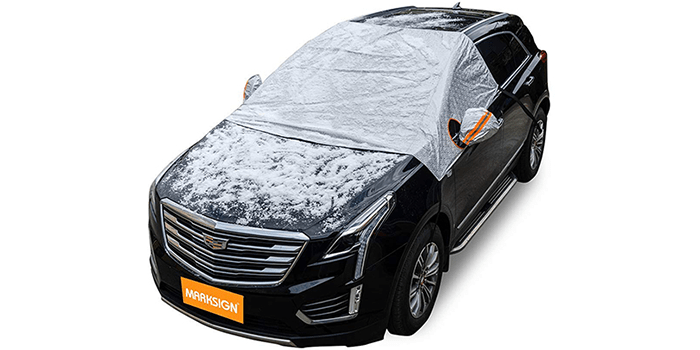 Using the Cosyzone Car Windshield Snow and Ice Cover will protect your car’s windshield from snow and ice in the winter and from UV rays in the summer. Forget about scraping away the ice from your windshield and enjoy a winter without snow on your windows. Thanks to the new extended design, your windshield wipers are also protected which extends their lifespan. There are three extra strong magnets to keep the cover in place while the elastic straps ensure a tight seal around the windows and doors. The cover is made from cotton, aluminum foil, and taffeta, a combination that makes it 100% waterproof. 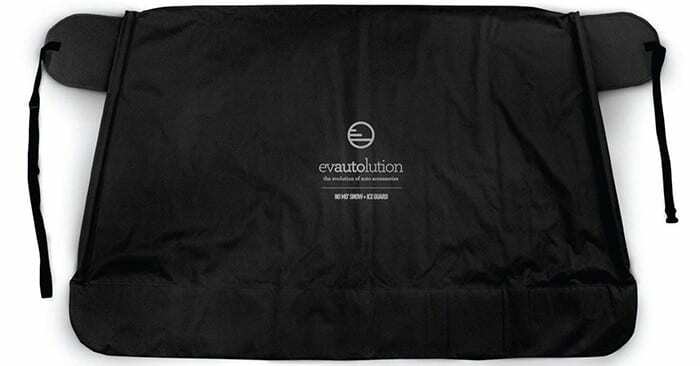 Regarded as one of the best and most premium quality windshield covers the market has to offer at this point in time, the Evautolution Premium Windshield Car Snow Cover delivers on every level. There are no magnets in this cover as they scratch the paint off your vehicle. With specially designed straps and weighted poles, this cover will stay in place no matter how heavy the wind is. With the side flaps tucked inside the doors, your car is protected not only from snow and ice but also from theft. Measuring 61 inches by 40 inches in size, this protective cover can fit on all car sizes with relative ease. Are you looking for a windshield cover that will protect your car against the elements regardless of weather? 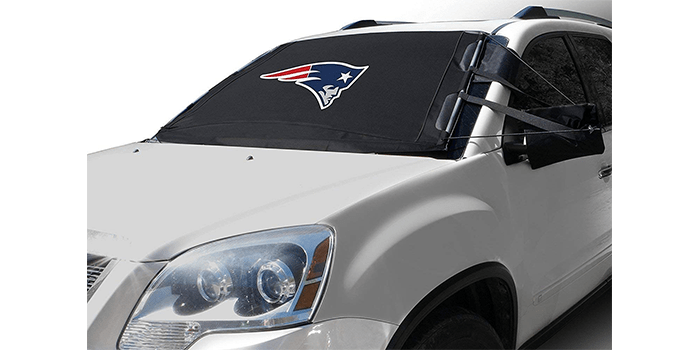 Then perhaps the FrostGuard NFL Premium Winter Windshield Cover should be what you’re looking for, a cover that frees you from having to deal with snow and ice on your windshield. The cover also protects the side mirrors. Even if you park your vehicle outdoors, you will never have to scrape or spray your windshield during winter again. Your windshield wipers are also protected during winter. Interestingly enough, this cover allows you to show your support by flaunting your favorite NFL team logo in the front. Furthermore, the cover measures 60 x 40 inches in size, which fits almost all cars including SUVs and smaller vehicles. If you live in a country that sees heavy snowfall every winter, the FrostGuard Pro Premium Winter Windshield Wiper Blade Cover is perhaps the best cover out there. 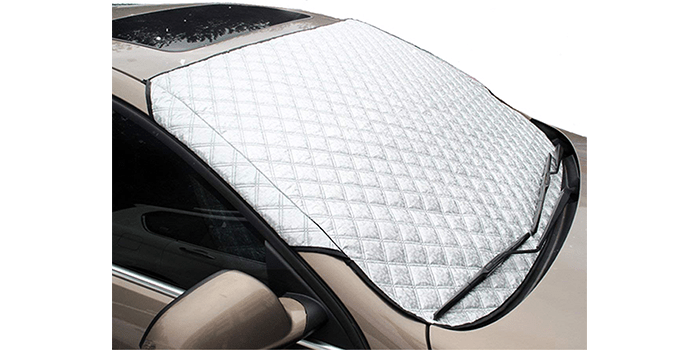 It is expertly designed to keep snow and ice away from your windshield even in freezing temperatures. 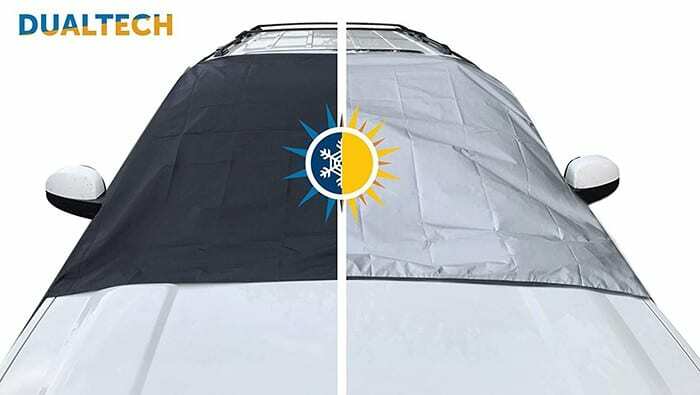 Even if you park your car outdoors, this premium cover will leave your windows and windshield frost and ice free so you never have to spray or scrape them again. Putting on the cover and removing it is extremely easy and can be done in a matter of seconds as the PVC lining keeps it in firmly place at all times.